This much anticipated sequel to the New York Times Bestseller Impossible a fantasy full of suspense, mystery, and romance will appeal to fans of Beautiful Creatures, Raven Boys, and Wicked Lovely. Fenella was the first Scarborough girl to be cursed, hundreds of years ago, and she has been trapped in the faerie realm ever since, forced to watch generations of daughters try to break this same faerie curse that has enslaved them all. But now Fenella’s descendant, Lucy, has accomplished the impossible and broken the curse, so why is Fenella still trapped in Faerie? How can she possibly choose to hurt her own cherished family not to mention the new man whom she’s surprised to find herself falling in love with? But if she doesn’t go through with the tasks, how will she manage to save her dear ones? 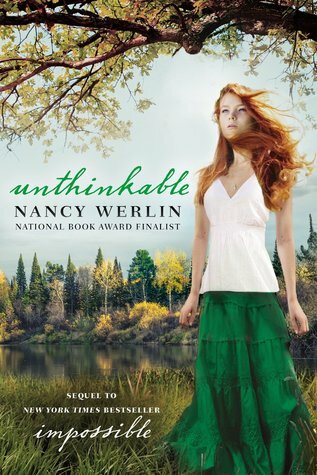 Okay, I have to say, Unthinkable is not *quite* as good as the first book Impossible, but it's still a pretty brilliant sequel. What I love is how inventive it is. The idea and plot for this sequel is amazing! It would be perfect if only I could've liked the main character more. I think the main problem people will have with this book is the main character Fenella. She's quite difficult to like, simply because she's trying to hurt her own family. Sure, she doesn't want to, and yes, it does bring some interesting conflict and tension to the story that had me turning pages, but in the end I just didn't like her. She causes so much destruction and pain, and I got a little annoyed with her woe-is-me attitude. Plus, I didn't like how naïve she was in the modern world. It's part of her character, of course - she's hundreds of years old and has never lived in modern times - but it's just another aspect of her character that frustrated me. All problems with Fenella aside, this book is just fantastic. The supporting characters, new and old, are all perfect. It was so good to read more about Lucy again and see her through Fenella's eyes. I adored Lucy's character in Impossible and still loved her in Unthinkable. She's much like Lucy from the Narnia books - they both have that same sweet and innocent spirit. And Ryland. Oh my word. I think he has to be my favorite character besides Lucy. He's turned into a cat in this book and is sort of a guide or companion to help Fenella. He just cracks me up. Not to mention the fact that he and Fenella can read each other's minds. Let's just say there was lots of giggling over his thoughts and reactions to being a cat. He definitely had the best lines! The plot is pretty straightforward: Fenella has to commit three acts of destruction. Despite disliking Fenella, I loved the plot and the conflict the storyline brings. Although it takes a while for the story to really get going, I loved the fantasy aspect of it and it definitely kept me turning pages. It certainly helps that the author has such a poetic yet fast-paced writing style; perfect for fantasy books like this. I especially liked the opening scene with the faerie queen - SO lovely. *sigh* As for the romance, I enjoyed Walker's character, though I can't say I really liked him and Fenella together. I'd absolutely recommend this for fans of Impossible! Aside from the unlikeable main character, it's a good continuation and worth reading. Great review, Kaitlyn! I'm really looking forward to the sequel because I really enjoyed Impossible. Glad you enjoyed it! Thanks, Sarah! It's really a fantastic sequel. Hope you enjoy it! !